Do you know if there’s a command to remove the usings across all of the project files? Would be easier than doing each one individually. I don’t know if there’s a way to do this across multiple files. You can use CodeMaid Visual Studio extension to do that. It has much more features along with removing all unused using from multiple files/entire project/solution. Right–now that the option is baked into Visual Studio, it’s one less reason to need Resharper. 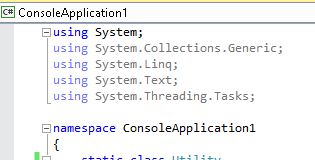 Note that for many large production codebases, Resharper is unusable because it slows Visual Studio and the compile/run/debug loop down too much to be effective. Hover over an unnecessary using directive (or type Ctrl+,) to display the Quick Actions SmartTip. From the SmartTip drop-down list, select Remove Unnecessary Usings. At the bottom of the details popup, select to fix all occurrences in the Document, Project, or Solution.